Last Saturday I drove to Klamath Falls, Oregon from Oakland, California. It was beautiful driving through the mountainous regions; however, I ran into what I thought was a “controlled” burn area near Klamath. I don’t watch too much of the news and didn’t realize that the state of Oregon was in a state of emergency. 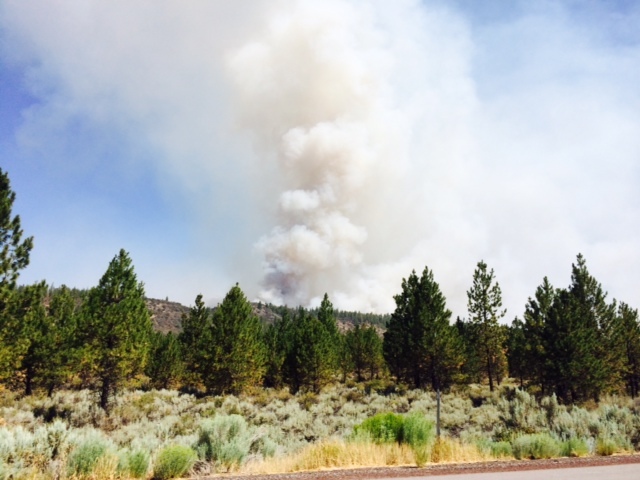 There were forest fires everywhere, I drove through a few areas that were heavy with smoke and burning. The aroma, and/or, oder in the air smelled like a campfire. 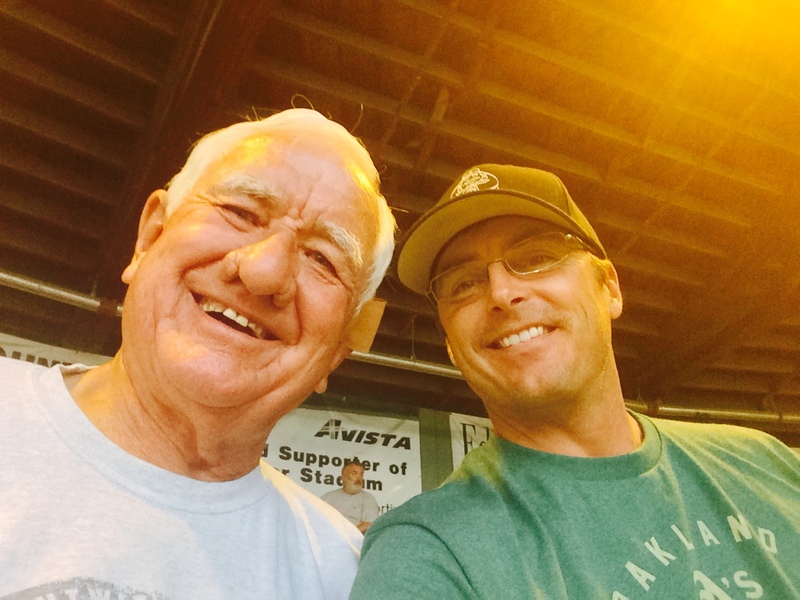 I was to meet a local reporter, Steve Matties, at 4 p.m. at the Kiger Stadium for an interview. When I arrived, the stadium was smoky and ash was falling. We met behind home plate and we were joined by another reporter, Brett Sommers, a Wisconsin native who just returned from his honeymoon. Go Badgers! Brett grew up in Stevens Point and has been in Klamath Falls the last couple of years. Steve is from Minnesota. Brett and I didn’t hold that against him, though, as we spoke. The play by play announcer came by and said that they might not have the game because of the ash. I panicked a little since that would screw up my game streak. We quickly looked for an alternative and found one in Bend, Oregon. The official score keeper walked by and Steve stopped him to discuss a play from the night before. He wanted his assistance in making sure that he got it correct. I was impressed with Steve. He discussed the play like it just happened and told the guy how he would score it. The score keeper told Steve he would make sure that he would score it that way. As Steve, Brett and I discussed the trip, I was on and all things baseball. The fog-like smoke started to clear and we were told that the game would be played. I was relieved. 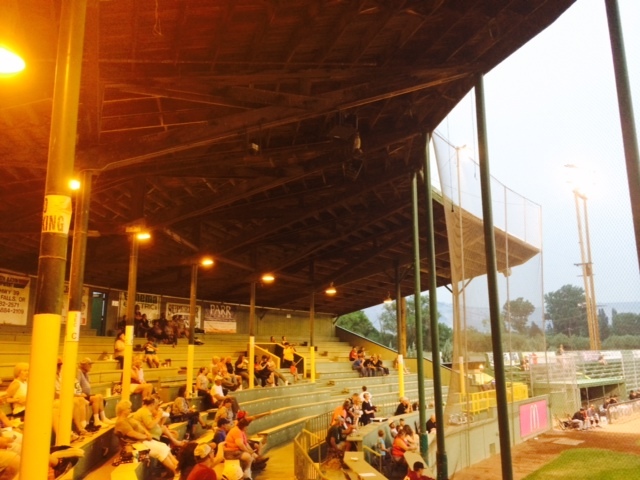 I didn’t want to drive to Bend since I was in love with Kiger Stadium. The structure was old and had personality, and well maintained. It has some history. 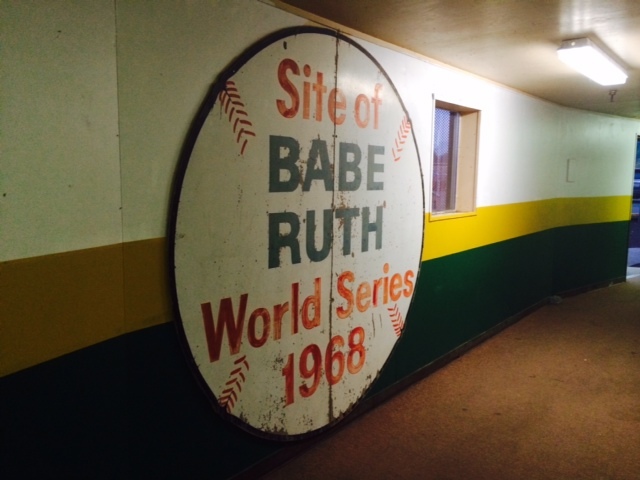 In 1968, the Babe Ruth World Series was hosted there; and, in 1970, Kiger was host the American Legion World Series. Besides that they had a mascot that was a bag of French Fries! Let me explain, Klamath Falls’ nickname is the Gems – that should clear it up. I always associate French Fries and Gems! Klamath Falls is named after a potato the grows well in the Oregon climate and is called a “gem”. I was confused and thought they were named after a jewel. Before the game started, Steve introduced me to Jerry Shea, who recited a limerick he wrote that he titled “Rememberings“:. And this little ditty will finish my prose. Watching you play under the lights and under the sun. Jerry had an entire book of these limericks! I was impressed with Jerry. 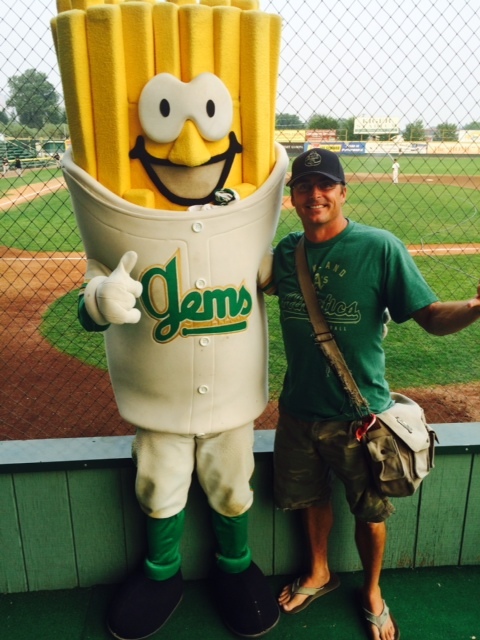 Steve told me that Jerry drove 105 miles to attend the Gems games. And, Jerry confirmed that it was 105 miles from his driveway in California to the stadium parking lot. I was shocked that he drove such a long way to go to a game. He said, “I was impressed with the caliber of ball and the atmosphere in the stands.” To say that Jerry has a passion for baseball is an understatement. He played organized softball and baseball in competitive leagues and on tournament teams for over 55 years, playing his last game when he was 67 years old. I repeated inquisitively that he quit playing at 67 and he laughed heartily when he thought about it. Jerry’s love for the game was ingrained in him at a young age. His father used to take him to games growing up in Los Angeles during late 1940’s and early 1950’s where he used to attend games at Wrigley Field (Yes. There was another Wrigley Field) at 42nd and Avalon streets was the Angels home field, when the Pacific Coast League only had eight teams. The league comprised of the Los Angeles Angels, San Diego Padres, Sacramento Solons, Oakland Acorns, Seattle Rainiers, Portland Beavers, Hollywood Stars and San Francisco Seals. I could see Jerry’s mind go to that time period. He told me he loves those memories and I could tell his memory was sharp since he was spot-on with the team names for that period of time (I Googled it to check). He reeled off a bunch of names of players he saw play. Of course, I wasn’t familiar with any of them; but, to him they were special. He told me it cost $.15 cents for him and $.35 for his father to get in to the games. 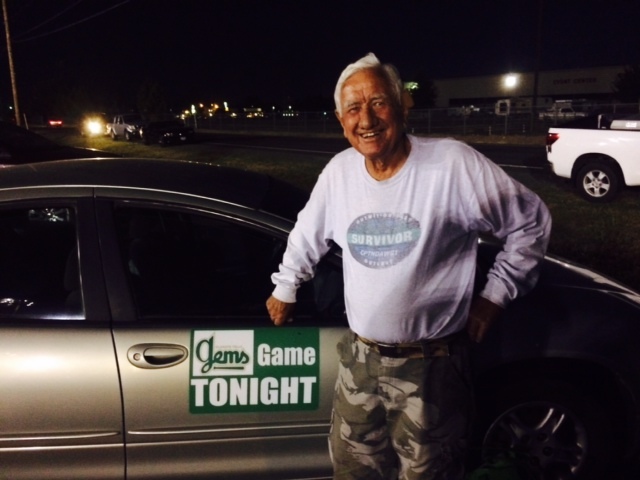 Jerry’s Car advertising a Gem’s game! Jerry says that he has experienced many things that a lot of people will never get a chance to do. He has tried out for Survivor numerous times and is very active in the Survivor chat forums. He says he has met so many wonderful people through that show and listed a bunch of names he considers friends who are associated with Survivor. He credits all of this to being a reborn-again Christian. When he was 59, he and his wife had a son. Unfortunately, she passed away when their son was only 18 months old and raised his son as a single parent. Also, he has two daughters that are in their late 40’s. He said he is very proud of his children. I asked Jerry what he did for a living. He said, “I have done a whole lot of crap”, while pondering it all with a smile. “I am a jack of all trades, master of none!” He laughs that hearty laugh again. Jerry is active in politics and it is very important to him. He has held many public offices, and he does currently. As we finish talking, he tells me about last summer when he had cataract surgery. He said he stayed with Bonnie Wallace, she hosts some of the players on the team. He stayed with her and the players took him to his appointments. He is grateful he has found this baseball family and will continue to come as long as he is able. Jerry told me that he will probably live until 114, so he takes care of himself. I could go on about Jerry. I only scratched the surface. He had so many great stories and he is a generous man with a that is very welcoming! Thanks for watching the game with me, Jerry. I know you were itching to walk around and talk to everyone. Your patience with me was very much appreciated. You are truly a “Gem” – but, not of the potato variety!